Almost all Nimbus luminaires can now be dimmed via existing 3-core building installations! All you need is a regular wall dimmer (phase dimmer realised as either a touch or rotary switch) and a 75 W central converter (555-916). Please note: A minimum load of 12 W is required. The higher the total wattage, the further the luminaires can be dimmed down. This new technology is already integrated in the new Modul Q 36 FRAME and CUBIC 36 FRAME surface-mounted luminaires! You can find more information on leading / trailing edge dimming here. With this technology, the lighting is controlled by a simple switch. Any luminaire can be dimmed by pushing the switch. Up to four electronic ballasts – depending on the manufacturer and device – can be controlled by means of switches, whereby the total cable length of all operating points may not exceed 25 meters. Sensors, such as those for presence and daylight detection, can also be integrated. The various switching and dimming functions are based on the current mode and the length of time the switch is pressed. Almost all Nimbus luminaires – that is to say all those equipped with the integrated "Light Control" option – are available with simple and flexible Casambi control. Most of our existing Nimbus LED luminaires can also be retrofitted with external "Light Control" units. This technology represents a practical, low-cost way of realising intelligent light control solutions based on Bluetooth wireless transmission – especially for 3-core cabling already installed in existing buildings. The system is configured using the free Casambi app for Android and iOS. Besides the app, suitable wireless pushbuttons can also be used to control lighting. You can find more information on Casambi here. To realise light control via a DALI (Digital Addressable Lighting Interface) control unit, you need a 5-core cable or a separate 2-core control cable to the luminaire or dimming units in addition to the 230 V supply of the power adapter. Up to 63 electronic ballasts can be dimmed via a DALI control unit. When using 1.5 mm² cables, 300 meters is the maximum length of the control cables. Dimming via a 1-10 V interface requires a VDE-compliant 2-core control cable from the control unit to the luminaire or the corresponding dimming units. Nimbus luminaires with such an interface can then be dimmed using a normal 1-10 V dimmer or via a gateway such as KNX that emits a 1-10 V signal. Our Nimbus LED luminaires can be upgraded to real team players by retrofitting them with ZigBee, thus doing away with the need for complex building management installations. Whether ceiling or floor-standing luminaires: almost all Nimbus luminaires can be integrated into an intelligent lighting network. Thanks to the integrated wireless technology and optional sensor system, our luminaires communicate wirelessly with other luminaires in the system. 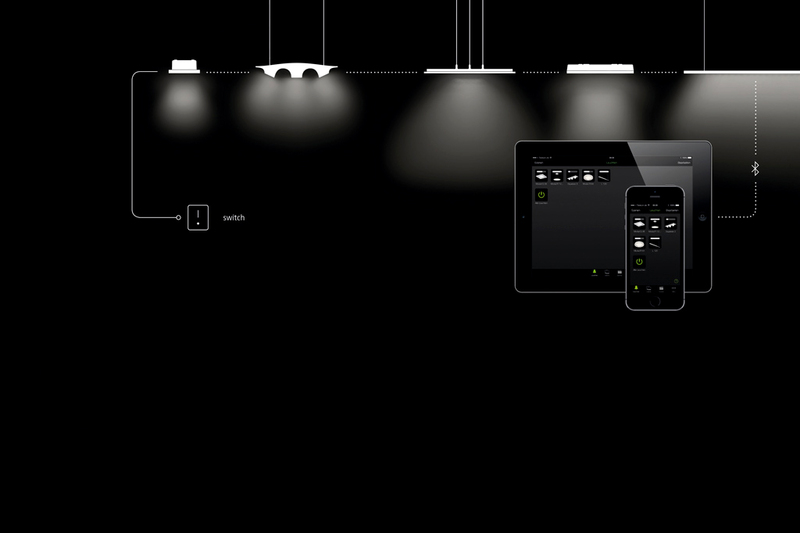 The lighting network is set up via a user-friendly interface allowing luminaires to be freely configured in lighting groups and scenarios. A ZigBee-based gateway is necessary to set up and control the light control system. This gateway has to be procured, configured and put into operation by an external partner. The configuration options, user interface and integration of external sensors or wireless pushbuttons differ from manufacturer to manufacturer. In the version without sensors, luminaires with ZigBee wireless module can be controlled using Philips Hue, Osram Lightify, Ubisys or Dresden Elektronik, for example. The configuration of Nimbus ZigBee luminaires with integrated sensors (PDLS) is only possible via a gateway manufactured by Dresden Elektronik. You can find more information on ZigBee here. Our IQ sensor technology closes the gap between a simple motion detection function and a more complex light management system. With this technology, Nimbus is able to offer ceiling luminaires equipped with sensors for detecting presence and ambient light. The sensors have been integrated in the luminaire head so that they are practically invisible; they react to presence, movement and ambient light. The OFF delay, activation and deactivation of the luminaire at a selectable level of ambient brightness as well as a dimmed standby mode can all be selected by means of an integrated rotary switch to suit (the user's) lighting requirement . Living areas, communication and contact zones, corridors, stairwells and WCs can all be equipped or retrofitted with this convenient solution: either as an autonomous single luminaire (stand-alone solution) or as an autonomous group of luminaires consisting of an IQ sensor luminaire and further slave luminaires connected to it. You can find more information on IQ Sensor here.